PRESENT POSITION:Mr. Brad Bollinger is a Valuation Consultant in the St. Louis area office of Klaris, Thomson & Schroeder, Inc.
PROFESSIONAL AFFILIATIONS: Mr. Bollinger is an Accredited Senior Appraiser (ASA) in the valuation of businesses by the American Society of Appraisers. EXPERIENCE: Mr. Bollinger has worked as a full-time business appraiser since 2002. He has prepared numerous business valuations for the purpose of estate tax, estate planning, purchase/sale, ESOP’s, financing (including SBA financing), and general corporate planning. His experience covers a wide range of industry sectors including manufacturing, retail, agriculture, construction, transportation, technology, wholesale, financial services and insurance. Additionally, he frequently provides discount opinions for real estate and investment holding companies, and partial interests in real estate properties. Mr. Bollinger has served as President of the St. Louis Chapter of the American Society of Appraisers, and regularly participates in chapter events. 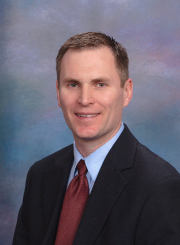 EDUCATION: Mr. Bollinger holds an MBA, with a concentration in finance, from the University of Missouri at St. Louis. He holds a BBA, with a concentration in finance, and a specialization in international business, from the University of Wisconsin-Madison. Mr. Bollinger has completed all educational requirements of the American Society of Appraisers in obtaining his Accredited Senior Appraiser designation. He participates in continuing education events and seminars offered by the ASA and other professional organizations.